skiers. My six Vermont grandkids have all been on skis about as soon as they could walk. 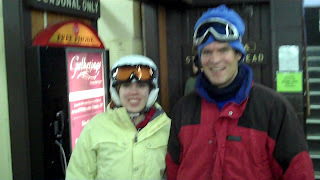 Daughter Tange and son Colin are both PSIA certified and son-in-law Terry has been on the PSIA demo team. 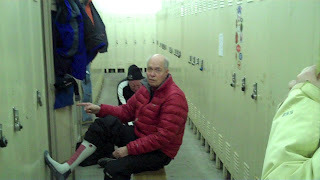 Terry now is the ski school director at Mad River Glenn too. Daughter Victoria is also a competent skier and her fiance can only be welcomed in the family by learning to ski too. As a former hockey player he is taking to the sport with a natural ability that we all admire. Today was a special day a Greek Peak since I had a chance to ski with the Bushnell dynasty. Tough Old Geezer Allen(Bottom picture), the patriarch, Paul(Top right) the son, and granddaughter Virginia(Top left). Allen's ski history goes back to the 1940's with bear trap bindings, wooden skis, and rope tows. Model A powered rope tows and ten cents in the can to get a ride up the slope. Paul is a first class racer at his home ski area in Michigan and I certainly admired his prowess today as he ripped up the slopes. Virginia was close on his heels with Allen and I bringing up the rear. Happy New Year everyone. And may 2010 bring us many enjoyable days on the slopes. Took one run behind Paul this morning. He can sure "turn them both ways" as the old saying goes. Very, very solid skier!